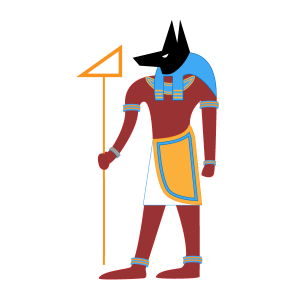 Sohcahtoa isn’t actually an Egyptian god, but if it helps to remember him that way, you’ll have an easier time recalling right angle trig relationships. Right triangles are extremely common in science homework. Even though they are common, they can be confusing to new students. That is why we have the Egyptian god SOHCAHTOA. SOHCAHTOA is a handy mnemonic trigonometry students learn to remember which sides of a triangle are used for the three main trig functions: sine, cosine, and tangent. These functions are defined by the ratios of various lengths of the sides of a right triangle. Let’s look at this right triangle. This triangle is made up of three sides of lengths a, b and c. Note the angle marked θ. This angle is formed by the intersection of b and c. The hypotenuse is always the longest of the three sides and opposite of the right angle. The side b is ‘adjacent’ to the angle, so this side is known as the adjacent side. It follows the side ‘opposite’ of the angle is known as the opposite side. Now that we have all our sides labelled, we can use SOHCAHTOA. Easy to remember. Now let’s see how easy it is to apply. The hypotenuse has a length of 10 and one angle of the triangle is 40º. Find the lengths of the other two sides. Let’s start with the side with length a. This side is opposite the angle and we know the length of the hypotenuse. The part of SOHCAHTOA with both hypotenuse and opposite is SOH or sine. solve for a by multiplying both sides by 10. Punch 40 into your calculator and hit the sin key to find the sine of 40º. Now let’s do side b. This side is adjacent to the angle, so we should use CAH or cosine. The sides of our triangle are 6.43 and 7.66. We can use the Pythagorean equation to check our answer. 10 is the length of the triangle’s hypotenuse and matches our calculation above. As you can see, our friend SOHCAHTOA can help us calculate the angles and lengths of the sides of right triangles with very little information. Make him your friend too. Boy do I ever remember that sohacha thing It was fun but that was then now we have laptops and apps that do all of that stuf.